1. To cause anything in motion or process to speed up or to move faster: To avoid being hit by the truck from behind, Mark had to accelerate his car. Lamont is sure that cutting taxes will help to accelerate economic growth in the country. 2. To make the accomplishment of something take place sooner: Martin had to accelerate his university studies in order to be ready for his final exams. 3. 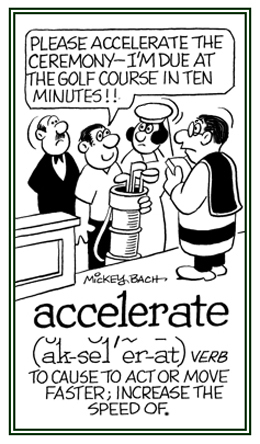 To cause to happen sooner; hasten: Resting often accelerates a person's recovery from an illness. 4. 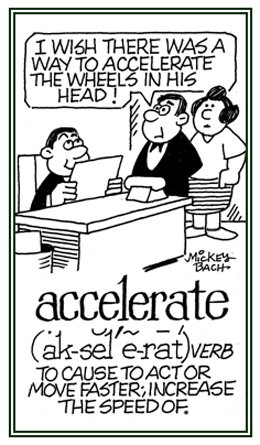 Etymology: from Latin ad-, "to" + celerare, "to hasten, to make happen faster"; which came from celer, "quick". © ALL rights are reserved.